A housewife in Abuja, Francisca Okechukwu, on Monday filed for divorce, accusing her husband, Tony Okechukwu, of sexually abusing their six-year-old daughter. 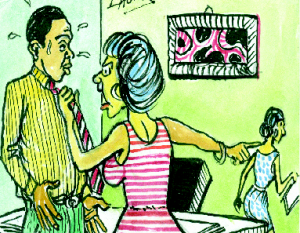 In her divorce application filed at Jikwoyi Customary Court, Abuja, Francisca, a business woman, alleged that she had, on many occasions, caught her husband fiddling with her daughter’s private part. “I caught my husband touching my daughter’s private part, his biological daughter”, she alleged. The petitioner told the court that she had been suspecting her husband of the act “ because of the way he carries the twin daughters. “Each time he carries the children (twin) on his lap, his manhood will rise up, and if he is not satisfied with that, he will go and pull off his cloth and tie his towel,” she told the court. The petitioner also alleged that her husband might have had carnal knowledge of her daughter. “There was a day the twin had a nap in their father’s room in the evening but when they were having their bath the next morning, one of them was complaining of a pain in her private part. “When I checked her, I saw a cut which pained her for over three days,” she added. She therefore begged the court to dissolve the marriage and grant her custody of the children. The husband, Okechukwu , also a business man, however denied all the allegations. The Presiding officer, Mr Labaran Gusau, adjourned the case to Nov. 16th for hearing.